Century Label, an Ohio-based label, sleeve and flexible packaging converter, is guided by cutting-edge technology, customer satisfaction and a deep religious faith. Century Label started in 1980 as Century Marketing. Its current owner, Al Caperna joined the company that same year. Much of Century Marketing’s early success came with what the company said was, ‘unprecedented popularity and demand’ for children’s fuzzy stickers. Century Marketing later changed its name to CMC Group, the parent company of Century Label. The early days at Century Label meant producing labels for what the company calls ‘Main Street businesses’, or small companies such as gift shops, florists, jewelry stores and bike stores. As the retail landscape shifted to big box stores in the 90s and early 2000s, Century Label shifted with its changing consumer base. But ironically, today’s retail landscape looks a lot like the early days at Century Label. Many of its customers today are small, independent and craft retailers looking for quality and inventive labels. Century Label caters to craft beer, specialty food and beverage, nutraceutical, health and beauty and industrial and chemical markets. It’s cornered the market on short-run, multiple SKU jobs, but has recently invested in equipment that will open the door to new markets and new strategies. The company was the beta site for the HP Indigo 8000 digital press. When Century installed it in 2016, they were determined to print shrink sleeves on it. 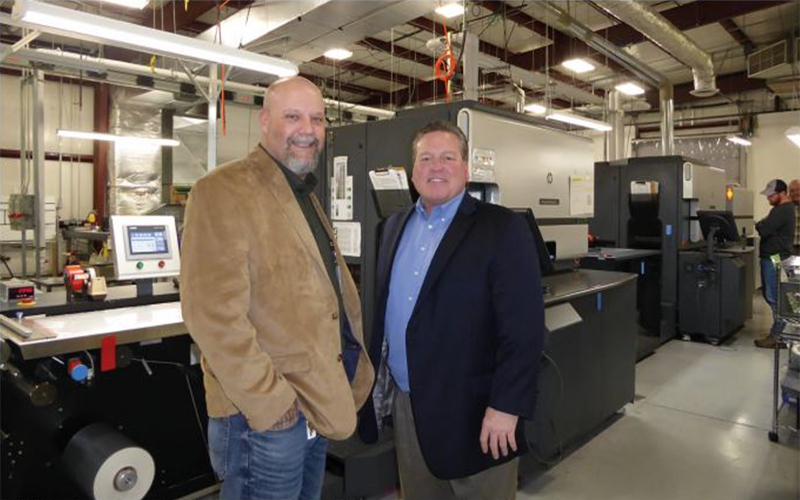 Two HP Indigo 6800 digital presses, and two 17 inch, 8-color flexo Mark Andy P5 presses round out Century Label’s printing machinery. Its HD Flexo press allows Century Label to print at 4000 dpi. Digital printing has been key to its success. For finishing, Century relies on equipment from AB Graphic, Brotech and Karlville. The company cites its Aztech inspection units as crucial to ensuring labels, sleeves and packages are quality controlled. The company uses Esko’s software in prepress and HP’s Mosaic for individualized and unique labels and shrink sleeves. In the past year, Century Label has seized on the growth of flexible packaging in the narrow web market. The company recognized the format’s rise when some staff members attended some end use tradeshows. Article originally published in the Feb-Mar 2019, Volume 41, Issue #1 of Labels & Labeling.